The biggest solar flare since the 1859 Carrington Event is about to bring the world to its knees. When a huge plasma ejection from the sun hits the Earth’s atmosphere, the resulting EMP pulse fries electricity grids and disables fragile electronics. Transmission wires melt, transformers explode and modern vehicles cease working. In less than a minute, the world is taken back two centuries. Lauren Nolan is attending a seminar in New York when the blackout hits and the transportation system grinds to a halt. Trapped in the panic that envelops the metropolis, Ellen worries for her children, five hundred miles away in North Carolina. Unable to get word to them, she faces a harrowing journey on her own. Sergeant Rick Nolan is overseas on a covert ops mission against terrorists. When the solar storm wipes out his communications and his air cover, he and his team find themselves on the same level as the enemy that surrounds them. Caught in a desperate fight for survival, Rick thinks about his family. How is he going to make it back alive? Trapped in their hometown of Charlotte, the two Nolan children witness society’s terrifying collapse as water pumps fail, food runs short and the law ceases to exist. Frightened and bewildered, they wonder if they’ll ever see their parents again. Solar Storm is Book 1 of an EMP, post-apocalyptic series about family survival and the challenges entailed. Contains moderate language and graphic action scenes. It's different than your average story and I had no idea how it was going to end. It gets better and better as it goes along and the characters stories are interwoven well. Thoroughly enjoyed this novel. It was well written, well thought out and had great believable characters. I also enjoyed that it was reasonably full length. One fine read and number two is just as good. Spoiler alert. This one starts with Sgt. Rick Nolan and his team of SF operators in Syria. They are on a search and info mission that turns into a fight for their lives when a Solar Flare takes out all of the electrical gear to include NVG's and the planes that are on over watch for the mission. Right now Rick and his team of Leroy, Jamie, Walt, Flynn and Scott are in a fight for their lives as insurgents are shooting at them. Being the operators that they are Rick and his team are taking aimed shots and dropping a tango with each shot. None of these guys spray and pray like the tango's do. One jet is still overhead and though he's low on fuel he rakes the tangos and then his plan quits as the solar flare hits. Kowalski is his name and he ejects and is recued by Rick. Back in the State Rick's wife Lauren is in NY for a meeting. A meeting that is cancelled. Lauren is also ex military and quickly realizes what has happened when all electric stop. Her cell doesn't work nor do the land lines and cars are stopped all over the road. Lauren has left she and Rick's home in Charlotte, NC for this meeting and she knows she will have to walk home. She left her two kids Josh and Lizzy with her mother and father and Lauren is determined to make it home to them. Rick is deployed in Syria and she has the feeling she won't ever see him again. Lauren steals a bike and heads for home saving a young black woman and her son along the way. She and April and her young son Danny will have one hell of a journey to get home. Rick and his team finally break it off with the tango's and head for a Syrian city that is controlled by the Kurds. On arrival they are met with far from friendly news. Rick and his team head out. Walt is wounded and Rick doubt he will survive. They finally make it to an old airport with a hangar and watch a group of tango's push a Cessna out and try to start it. Kowalski tells Rick that these guys have no idea how to start an plane but he does. They wait for the tango's to leave them pull the plane out and Kowalski gets is started. The tango's had already filled the tanks with gas as that's what the Cessna runs on. They then take off headed for Europe, the UK, Scotland and Greenland to get back to the US. So begins one damned fine well written read. This one has Rick, Scott the sole survivors of Rick's team, Lauren, April, Danny, Lizzy, Josh, the grandparents who don't survive, a crazy man who takes Josh and Lizzy prisoner, a Lauren and April who have to fight off rapists and murderers all the way home, a Rick, Scott and Kowalski who have to land the plane on highways to siphon gas, a Rick, Scott and Kowalski who make it to Scotland and are welcomed by an entire village, a Lauren and April who are captured, a Rick and his team who finally make it to Charlotte and Rick and Scott making it back in time to save Josh and Lizzy and Lauren and April arriving right after. 5.0 out of 5 starsMore in the going home sub-genre. Author Lopez is certainly in the top tier of post apocalyptic writers. the book moves among three different groups of people, and not necessarily on cliff-hangers. Two of the sub plots are trying to get home over almost impossible distances--will they make it? Great suspense! The plot jumps alive as he describes it, and it moves along at just the right pace. It is very easy to follow and visualize. He knows his details and doesn't skim over them like other writers. Very highly recommended. Waiting for Book 2! There's w-a-y too much irrelevant filler and mindless pontificating than invokes regular skim-reading to get back to the story. The writing is OK - just needed tightening up. As the story continually jumps between on-going aspects in widely differing regions: a heading to each section / chapter giving the locale would have made the readers' experience easier. SO: a slightly annoying - but basically enjoyable - read. 5.0 out of 5 starsLoved this book and can't wait to read the follow up! I really liked this book as it tells the story of an EMP strike and the effect it has on one family. Husband is away fighting ISIS and the mother is away at her new job. 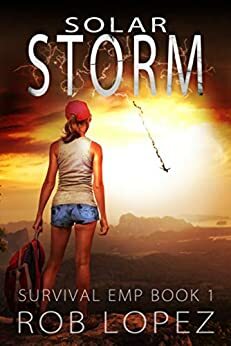 The kids are left in the care of their grandmother in North Carolina and when the EMP hits, it shuts down the world as we know it. Then it is up to the mother and father to reach home from their respective locations to put the family back together, if there is a family left. I really liked this book and think you will too if you are a fan of this sort of thing. Compelling beginning to a tale of apocalypse in USA. Rick is in the middle east in the army. Lauren is working a corporate job in the US but several states away from their 2 children. Children are staying with Lauren’s parents until Lauren gets back from her job. Massive solar storm hits earth and life as usual ends. Nothing and nowhere is safe any more. Rick and Lauren struggle against horrible odds to get back to their children.